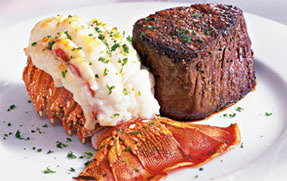 It’s the little things that make life exciting, like the Fleming’s Prime Steakhouse & Wine Bar filet mignon and North Atlantic lobster tail combination back for spring until April 7. I’m thrilled because lobster with drawn butter is my mother’s favorite (I’ll be taking her soon) and this savory combo, at only $37.95 (excluding tax and gratuity), comes with a choice of the wedge salad or French onion soup to start, and sautéed spaghetti squash with lime butter with entrée. Simply add wine and dessert. This treat is only available at all locations and upon request and I suggest a reservation, however eating in the bar is fun too!